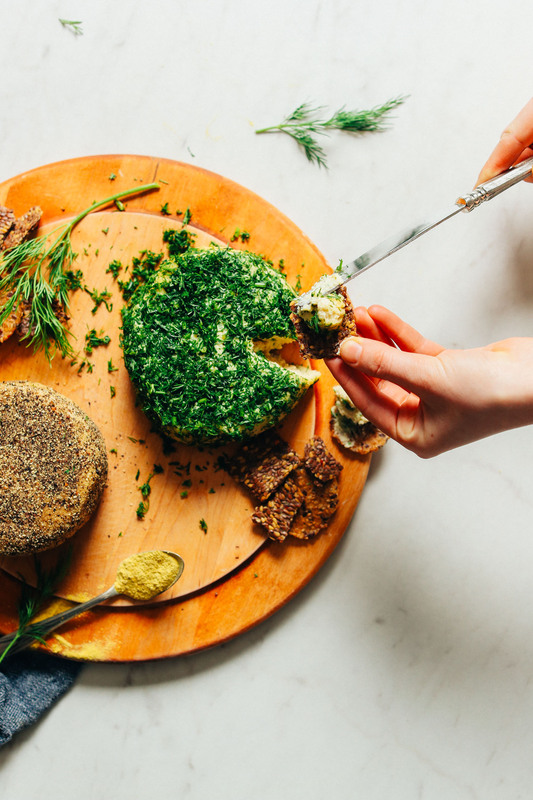 We’ve made vegan cheese before (Vegan Garlic Herb Cheese + Spicy Pimento Cheese Ball), but not like this. This version has the good stuff in it – probiotics! That means you’re helping your gut while you’re indulging. How cool is that? The base for this 6-ingredient cheese is either soaked cashews or slivered almonds! That’s right – two ways. It’s magic. 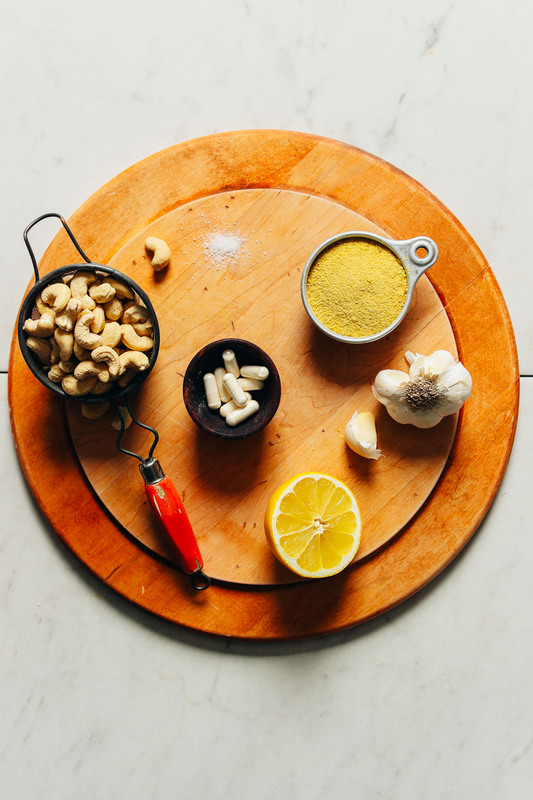 Once soaked, the cashews are blended until creamy and smooth with delicious things like fresh garlic, lemon juice, nutritional yeast, and sea salt. Mmm, it’s already looking tasty. Next come the probiotics! You’ll add these in after blending and stir until combined. Just as with our 2-Ingredient Coconut Yogurt, probiotics combined with liquids (or cheese in this instance) culture when left at room temperature. This means the good bacteria are mingling all up in it, intensifying the tanginess and flavor! Once it’s mixed, simply wrap in a towel or cheesecloth and let it hang out on your counter for 24-72 hours. The longer it sits, the tangier and firmer it becomes. We found 48 hours to be our sweet spot. This would make the perfect appetizer for parties or friend dinners. It would also be a delicious snack or side to just about any meal! If you’re into vegan cheesy things, also be sure to check out our Best Vegan Gluten-Free Mac ‘n’ Cheese, Roasted Jalapeño Queso, Vegan Mozzarella Cheese, Vegan Parmesan Cheese, Whipped Almond Ricotta Cheese, and 5-Minute Vegan Macadamia Cheese! If you try this recipe, let us know how it goes! 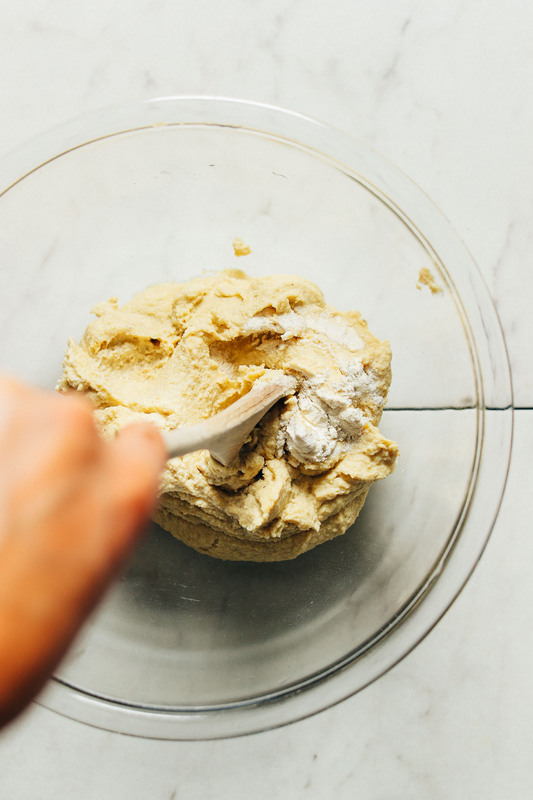 Leave a comment, rate it, and don’t forget to tag a photo #minimalistbaker on Instagram so we can see what you come up with. Cheers, friends! 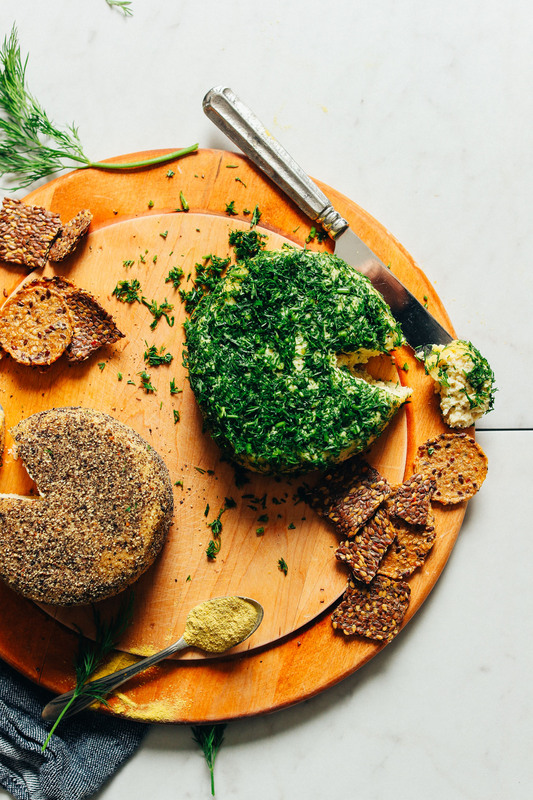 Easy-to-make vegan cheese with probiotics for an extra tangy, cheesy flavor! Just 6 ingredients and simple methods required. The perfect party appetizer, snack, or spread! Place cashews in a bowl and cover with cool water. Soak for at least 6 hours. In a pinch, soak in very hot water for 1 hour. If using almonds, no need to soak! 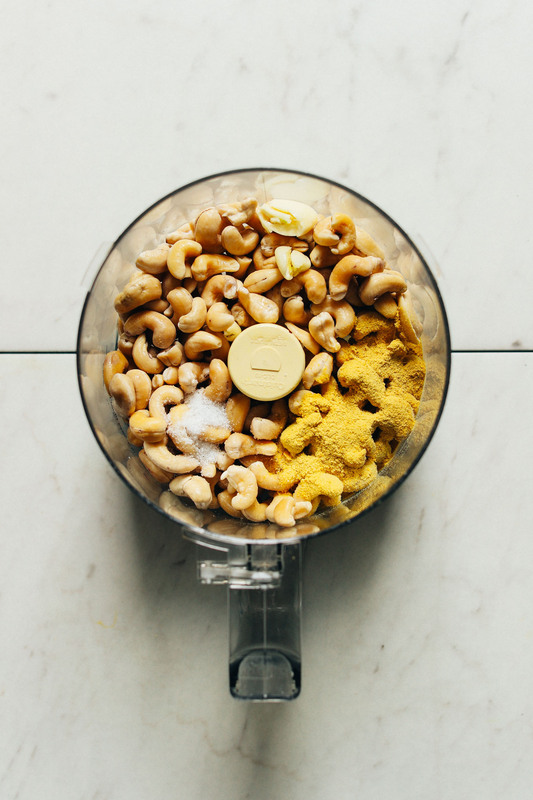 Once soaked, drain cashews thoroughly and add to food processor (if using almonds, add unsoaked to a high-speed blender for creamiest texture). Add minced garlic, lemon juice, nutritional yeast, and sea salt and process until very creamy and smooth, scraping down sides as needed. Add the water a little at a time until a creamy consistency is reached. Taste and adjust seasonings as needed, adding more lemon juice for acidity, nutritional yeast for cheesiness, garlic for zing, or salt for saltiness. Transfer mixture to a mixing bowl and add probiotic capsules. Stir to combine with a wooden or plastic spoon (not metal, as it can tamper with the effectiveness of the probiotics). 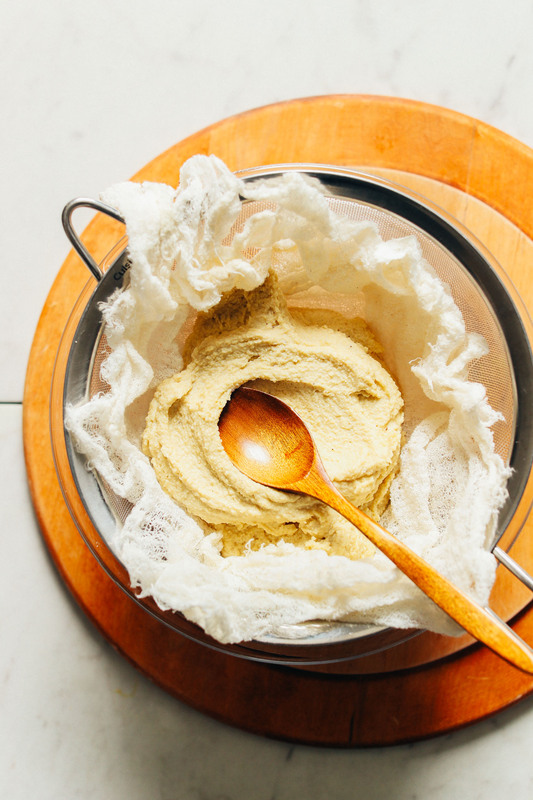 Place a fine mesh strainer (or colander) over a small or medium mixing bowl and lay down two layers of cheesecloth (or a clean, fine, absorbent towel). Use a spatula to scoop the cheese mixture over the cheesecloth. Then gather the corners and gently twist the top to form the cheese into a "disc." Secure with a rubber band. Leave to set on the countertop at room temperature for at least 24 hours, up to 72. We found 48 hours to be the sweet spot. The longer it sits, the firmer and tangier it will become. Once the cheese has cultured enough for taste, transfer to the refrigerator to set for at least 6 hours to firm/harden and chill. To serve, carefully unwrap from cheesecloth and gently invert onto a serving platter. Reform with hands or cheesecloth as needed. Then coat with chopped herbs, black pepper, or spice mix (optional). It can be fragile, so handle gently. Enjoy chilled with crackers or vegetables. Cheese will hold its form for several hours out of the refrigerator, but best when chilled. Leftovers keep well covered in the refrigerator up to 7 days (sometimes longer) - you'll know it's bad when mold has formed or the taste is no longer appetizing. *For probiotics like Renew Life 50 billion and Jarrow // make sure your probiotics don’t contain PREbiotics or the recipe won’t work. *Nutrition information is a rough estimate based on 1 serving (~2 Tbsp) calculated with cashews (not almonds) and without optional serving ingredients. *Prep time reflects quick-soaking the cashews for 1 hour and letting the cheese rest for 48 hours. I only have a 5 billion probiotic. Do you think it would work if I added a lot of them? I feel like 20 ( to equal what the recipe calls for) would be too many. Thoughts? Another question, sorry! I have some probiotics that are a little old and have been left out of the fridge, do you think these will work or should I buy some more? Very keen to make this but we’ve run out of nutritional yeast. Do I need to go out to get some or can I crack on and hope for the best? I personally wouldn’t skip the nutritional yeast, but let us know how you make out! Hmm been wondering about trying water kefir grains whizzed into the mix as the probiotic. Will report back after experimentation. I have been playing with making cashew cheese lately and I am curious to see how it turns out by adding probiotics. I wonder, could I also use agar in this recipe to make the cheese firmer? Outstanding. I made it and tied it to the middle of a wooden spoon that I then suspended over a bowl between two tall jars. Then I transferred it to the wine cooler that is my cheese cave. I’ve left it in there for a week – wow. I made it before but this time it’s even better. As well as herbs, I’ve sprinkled sumac on it – yum. And I adjust the garlic, nutritional yeast etc. 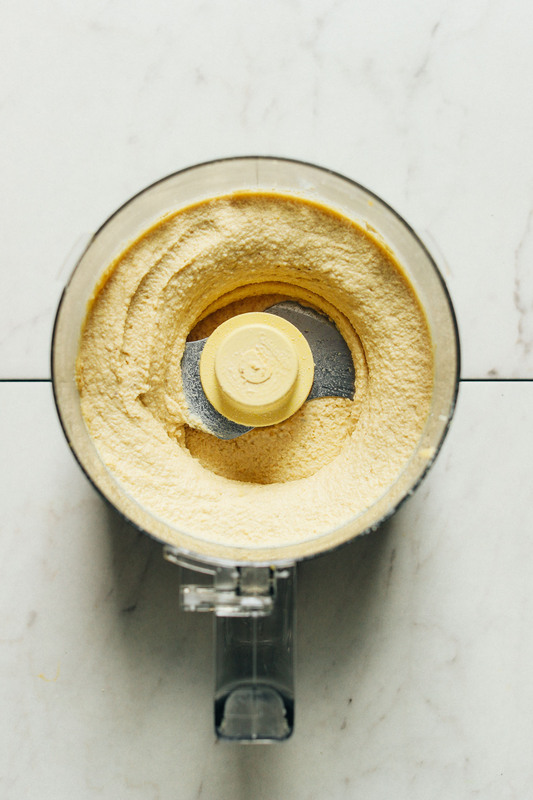 Oh by the way, cashews are definitely easier to blend and come out smoother than almonds. I’d add a bit more liquid to almonds next time and then let the excess liquid drip when it’s hanging. A little seasalt sprinkled all over the cheese adds flavour and inhibits mould – I think. I also made ir with almonds, bit there’s no liquid.. Am I missing something? I added a bit more water but just enough to be able to blend it.. Is resting inside my microwave and I made the disc with cheesecloth… Anything I need to know? Hello, this looks fab – does it melt? I’m looking for a melty cheese to add to burritos and pasta! Thanks! Hi Kay! It doesn’t melt like real cheese and I would think of it more as a soft cheese for serving with crackers, but you could definitely try adding it to pastas and burritos! This looks delicious and I’ll for sure be making it in the next couple of days. I had a question. I make my own cultured vegan butter using few tbsp of cultured vegan yogurt to get the ‘culture’. It works like a dream. Wondering how you think that would work for the cheese as sub for probiotic caps. Would love to know your opinion. Hmm I’m not sure, Joys! If you experiment with it, report back on how it goes :) Good luck! As long as it isn’t on the cheese, it should be fine to consume. This looks so lovely! I am allergic to nuts, so would subbing sunflower seeds for almonds/cashews work? Hi there! I haven’t tried making this recipe with anything other than almonds and cashews, but I would guess that seeds such as sunflower or hemp may work! If you try beans, let us know! This looks so good! I’ve made a similar cheese before and coated it in herbs de Provence. I’m trying to find a recipe to do one with cranberries and walnuts on the outside for thanksgiving. I feel like this is a good base recipe but just may want to leave out the garlic. Thoughts? Maybe add a bit of honey or maple syrup to sweeten? Hello, I’m wondering if when we set it out for 2-3 days at room temperature, do we leave it uncovered, resting on the colander? Thanks. No, I’d definitely cover it in a layer of cheesecloth. I am so excited, just made the recipe, I don’t have final results yet, will let you know in 48 hours! Hi Katie! We’ve heard that if you soak the cloth in vinegar before putting the curds in, it helps decrease sticking. We haven’t tried this ourselves, but if you test it out, report back! Good luck! I’ll keep that in mind for next time – thanks! Just made it and … success!! We already ate half of it spread on toast for breakfast. Could I use 1/2 a cup of rejuvelac instead of water and probiotics? We haven’t tried and can’t say for sure but if you experiment with it, report back! Good luck, Meg! Hello! May I ask if we can sub the probiotic capsules for non-diary yogurt? Since yogurt does have some strains of bacteria as well! We haven’t tried that and can’t say for sure, but report back if you experiment with it! No dill to be had in this town so I sprinkled this with za’atar after having it dry for about 15 hours. Seriously good. I may add chilli next time because I am an addict. There will be a next time, time after that and again. So much better tasting than any cheese spread I have had. Smart! Glad to hear you enjoyed it, Jill! I’ve just made it, followed the recipe and it’s been sitting in cheesecloth in a metal colander on top of a bowl for about 18 hours. It smells really strongly – I’ve never made anything like this before – is there a chance it’s going off and isn’t fermenting properly or is it supposed to have a strong smell? Hi Katrina! If it smells ‘off’ or like its gone bad, we don’t recommend you consume it. Perhaps the mixture was too wet or bad bacteria got introduced at some point? Or, did your probiotics have prebiotics? Hi, thanks for your reply! I wasn’t sure if it was off, or just a normal smell by it was a strong smell! In the end after about 40 hours i smelt it again and determined it was strong but probably not off. I tasted it and it was delicious and I covered it in dill and served it at a party and it was the biggest hit there!!! Thanks for reporting back, Katrina! Would vegetable rennet tablets work as well? I’m not sure, but let us know if you give that a try! Hi there, I LOVE your blog. Im having a hard time not loosing a lot of the vegan cheese to the cheese cloth, any tricks you could let me in on so I don’t feel as though Im loosing my expensive purchase of organic nuts. Thanks so much, keep creating, its such an inspiration. Hi Lindsay! I recommend doubling up your cheesecloth (fold it over) to ensure that all of the good stuff stays where it should stay! Hope this helps. Thank-you so much for this recipe. I have been buying Kite Hill Cream Cheese and that can get to be expensive on a retiree budget. I am so excited about this recipe. I am off to order probiotics. We hope you love this recipe, Suzie! I just made this… well, 48 hours ago. I left it on the counter for 24 hours then placed it into the refrigerator because, um, just a tiny bit scared about bad bacteria creeping in. Plus, the good bac continue to work even when the temp is lower. Anyway… SO GOOD! This cheese will work well on a cheese and appetizer platter or crumbled like cotija or queso fresco. Definitely putting it on my vegan tacos tonight. Yay! Glad to hear it, Pamela! This cheese was so satisfying! I went with a cashew base and wrapped the finished product in dill. I used acidophilus probiotic capsules. Mine only contain about 2.4 billion cultures per two capsules, so I put about nine or ten into the mixture. It wasn’t near the 50 billion that the recipe called for, but the cheese still had a wonderful tang to it. I let it sit out for around 40 hours before removing it from the cheesecloth and wrapping it in dill. I made this as a special treat for my family (not plant-based) a month ago and they continue to rave about how delicious it was and how they couldn’t believe it was vegan! Just made this and it’s now going to sit on my counter for the next two days. Anyone have advice on how to make time go by faster so I can taste this creation?? I just made this, it is currently sitting in cheese cloth. I realized after that my Jarrow probiotic contains FOS at natural prebiotic. What has been the results if a probiotic with FOS was used? I am crossing my fingers it turns out. Love your site! I made this a few days ago and the bottom of the cheese has big mold spots—is there any way to avoid this in the future? I followed the recipe exactly. Looking forward to giving it another try. Hi Emily! Perhaps the mixture was too wet or bad bacteria got introduced at some point? Or, did your probiotics have prebiotics? I let it sit for 72 hours after testing the taste at 48 hours and wanted more tanginess. I used cashews and love it! Actually ate so much that I couldn’t eat dinner. Yay! We are glad you enjoyed it, Nicole! I just made this, and it is very yummy. However, I found that getting it out of the cheesecloth is quite difficult. The cheese, while sitting out forms a rims on it, so wouldn’t it be better to form first, then wrap in cheesecloth? Not sure, but seems like it may be less messy. Unfortunately the rind kind of mixes in with the rest of the cheese. Do you have any suggestions for dealing with this? I like the rind, but creates an uneven texture in the end. I accidentally added the probiotics during the blender process – will that mess things up? Yes it may, but let us know how it goes! Yay! We’re so glad to hear that, Jessica. Thanks for sharing! I left mine out for 48 hours and it developed a rind (I live in a very dry region & it’s been pretty warm lately). The flavor is amazing and I just didn’t eat the rind (I guess this could be akin to “vegan” parmesan cheeze). Next time I might add more water so it doesn’t develop the rind, but overall I am very pleased with my first cultured cheeze experience! The rind is a good thing in our opinion! But if you didn’t like the rind, yes, maybe add more water next time. The rind is good. If it’s too moist I find it hard to get out of the cheese cloth. Any suggestions on that? I can’t wait to try this. I tried your vegan sour cream recipe, and it was awesom. My question is this, would running the nuts through a spice grinder before soaking create a a smoother textured cheese, or would it make it more rubbery? Thanks! Hmm we haven’t tried doing that and can’t say for sure. I made this over the weekend, and it is really very tasty. I’ll be sure to make it again. Thanks for the recipe. The next time I make it, I’ll try rolling it into little balls like mozzarella balls. That way I can just pop one in my mouth. Made this recipe this afternoon and used RenewLife Ultimate Flora Saccharomyces Boulardii 6 Billion. After reading up on saccharomyces boulardii I’ve learned it’s actually yeast and not bacteria. Is this still going to turn out okay? Mostly concerned about mold or any safety issues, especially so because I’m pregnant. I’ve tried doing some research online without much luck for this specific scenario. Hoping you might have some insight. Thanks! Also, I have it elevated on a metal cooling rack instead of a colander and the bottom of the cheese is getting dark lines and a few dark spots. Yes, I recently tried Kite Hill’s almond cream cheese and that blew my mind (delicious!). And then I made this recipe and, wow, delicious! Easy, brilliant. Again, delicious. Doesn’t matter if you dairy or not: deeee-lish. Many thanks for crushing out a perfect recipe. Hi! I followed the recipe exactly, used cashews and left it on the counter for 48 hours. Put it in the fridge in a container (still wrapped in cheese cloth) over night. Just took it out this morning and it tastes AMAZING!! Will definitely be making again!! Thank You!! Yay! We’re so glad to hear it, Chelsea! Hi! Thanks for this. Would whole blanch almonds work as wellas slivered? Do they need to be soaked? We haven’t tried and can’t say for sure but report back if you give it a try! Yes I let then sit in really hot “really hot” for an hour or two due to there density, you want it to be as creamy as possible and not have to blend forever, You can also use the ones with the skins. Dump boiling water on them, let them sit awhile and the skins will pop right on off. Vegan cheese and I are not THAT close, but we’re more-so like acquaintances. I love me a good vegan cream cheese, but I wouldn’t buy or make vegan cheese. However, I am a sucker for tackling on new projects when it comes to making my own homemade creations! I recently got into making my own baguette bread and I am OBSESSED. So, I’m feeling ambitious and thinking about trying to make vegan cheese, nut milk, or kombucha! We hope you enjoy it, Cassie! Hi! I’m 24 hours in..was just wondering if it needs to stay in the colander? Looks and smells great so far! Great recipe! To be clear, would we break apart the probiotic capsules before adding? Or will they somehow dissolve while soaking? Yes, open the capsule and empty the powder into the cheese mixture. Have never used probiotics. Bought some for this recipe. They are RenewLife 15 billion. How many capsules would I use? Thanks. Maybe use a couple more than recommended. Hello! Another fabulous recipe once again. Is there a “nut free” substitute/version of this that could work? Perhaps try seeds, such as hemp or sunflower! This might be a stupid question, but would different brands of probiotics produce a different flavour? I once tried making your coconut yoghurt recipe and it turned out horrifically – a weird chemical-like taste. Could it be because of the specific brand I used? Hmm, I suppose so! Try using one of the ones I recommended (or a comparable high quality brand) for best results. Are the probiotics needed for the recipe or only for the purpose of providing probiotics? I make several fermented foods and drink that has them it. The probiotics used in this recipe are not plant-based and are derived from milk products. Mike, I use the Puradyme, LiyfBiotic probiotics. They are vegan. 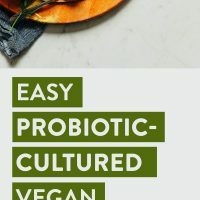 Other post on how well it works in making dairy-free yogurts (however, it does have prebiotic, but it doesn’t seem to deter anyone). It is also approved by Dan the Man (he is a raw vegan on Instagram). Hope this helps you. Shannon, make sure not to use any probiotics with PREbiotics – it affects the fermentation and the cheese likely won’t turn out. Mike, the vegan probiotic I recommend using is Jarrow! Could you substitute the nuts for chick peas? My son has a nut allergy. I want to make the cheese for me, but I’d rather not use nuts. Thanks! I was thinking the same. I’m going to try raw sunflower seeds in this recipe. My son’s girlfriend is highly allergic to nuts, too. Hey Dana! I buy 30 billion probiotics from Trader Joe’s that don’t need to be refrigerated. If I use 3 capsules do you think that’ll work? I think so! Just make sure they’re capsules and not pills (which require to be crushed). Do you think it’s cheese could be frozen? I’m going to be the only one eating it so that’s a lot of cheese! I think so, but we haven’t tried it yet. If using out of the freezer, let thaw for at least 1 hour, or until soft. Hi Dana! this looks so so yummy. I’m currently avoiding lemon, garlic, and yeast— which is half the recipe, haha! i’m assuming lemon is essential for acidity reasons, but how substitute-able are the others? Thanks :) i love all your recipes btw! I look forward to trying this. One question- would 1/2 cup Kombucha instead of water provide probiotics? I make my own kombucha and am trying to find additional ways to use it. hmm, I’d think it would infuse a unique flavor, but would most likely produce the tangy fermented flavor you’d desire in “cheese.” Let us know if you give it a try! Did you try using the Kombucha? I’m very curious…. Thanks!